Without the basic understanding of how our body works, the interconnectedness of our organs, systems, and emotions, it is difficult to make wise dietary choices. Everyone has read or heard a lot about health, dieting and detoxification. And, everyone has an opinion about what to eat or what to take. The question is 'WHY' do we need to consider what we eat, pH, detoxification, our teeth and emotional health, etc.? 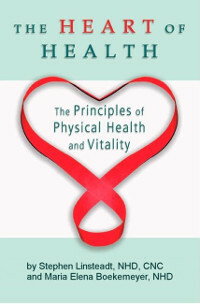 The "Heart of Health - the Principles of Physical Health and Vitality" provides specific, easy to understand, information to help people MAINTAIN or REGAIN their health: life-style changes, what foods to choose, and the reasons these recommendations are so vital to optimal health and vitality. But there is more to read.... Our mental and emotional attitude is also critical, as are movement, water, healthy teeth, detoxification, sunshine, and sleep. Have you ever wanted to read just one book that tells you exactly what you need to do to prevent those degenerative illnesses that are weakening and killing over 70% of the country's population? This book lays out, in simple terms, the 14 principles of energy and nutritional medicine that work together as the core foundation or the 'heart' of health. The principles include: pH, detoxification, dental health, stress management, diet and nutrition. Oriental practices and modern European technologies are combined into a practical guide used successfully by the authors with thousands of people. The Heart of Health explains the role bio-photons, scalar waves, and electrolytes play in our human inner body-mind communication system and how the status of our bio-ecology determines the health of our immune, nervous, and hormonal systems. The holistic approach of this book clearly shows how proper cellular nutrition supports the various metabolic functions that create cellular energy, helps us to detoxify, and protects us from oxidative stress. The Heart of Health introduces the Scalar Heart Connection™ technique; a powerful tool for bringing about positive change by helping to transform the negative frequencies of our thoughts and worries into positive, life-enhancing vibrations. Scalar waves act like waves of unlimited potential that are impacted by our thoughts, emotions and intentions. This provides a bridge from the energetic, quantum field to the physical. The Heart of Health provides you with an understanding of your physical, mental and emotional bodies and the know-how to preserve or regain your health to freely enjoy a life of optimal health and vitality. "Thank you so much for your wonderful book, 'The Heart of Health.' What a wonderful, clear explanation of how our bodies work and interact with the universe. This book is right up there in the same genre as 'What the Bleep Do We Know?'" "Thank you for your excellently written book. It puts so many pieces together in a clear, precise manner. I have just ordered another book, CD, etc. Blessings." "I have to mention sooner rather than later that this is one of the best books I have read on health! Thank you for all this research. Great work!" "A remarkable journey through the concepts of energy medicine that makes it abundantly clear how our thoughts and feelings affect our cells and determine the amount of health we experience in our daily lives." "A comprehensive, yet easy to understand, explanation of the importance of proper nutrition at the cellular level. This is a 'must-read' for anyone who is chronically ill and also has a history of dental problems. The relationship between dental health and illness is particularly well documented." "Dr. Stephen Linsteadt and Dr. Maria Elena Boekemeyer have managed to uncover and share with their readers very powerful information on the Principles of Physical Health and Vitality. Every reader who takes the time and thoughtfulness that this book requires will discover a treasure of inner guidance to Optimum Health." "Your explanation of what a scalar wave is the best I have seen yet. It's been confusing to me what Scalar waves really are, being at the quantum level of potential that they are. Thank you once again. I am very grateful for your level of understanding, dedication and service to the field of true healing." "I highly recommend this book for a deeper understanding of the field of unlimited potential which can be directed for healing ourselves and others." "Stephen, Thanks for writing 'The Heart of Health' along with Maria Elena Boekemeyer. Writings such as this have improved my existence tremendously and I am grateful to you."